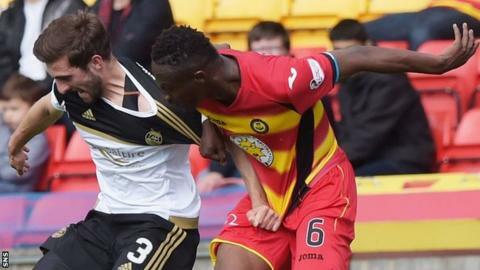 The Scottish Premiership game between Partick Thistle and Aberdeen has been postponed after a 15:30 GMT pitch inspection at Firhill Stadium. Referee Bobby Madden called off the game because of a waterlogged pitch. Thistle had said on Thursday that the pitch was "absolutely fine" and that, if the game were played then, it would "be perfectly playable". The Glasgow club have had three home games called off this season against St Johnstone, Dundee Utd and Motherwell. Thistle have been using sand to deal with the threadbare sections of the pitch. Aberdeen manager Derek McInnes expressed his disappointment as he thought his side would have bounced back from Monday's 3-1 defeat by Inverness Caledonian Thistle. "We came down last night and did a bit of training this morning and obviously, with the weather, we anticipated it." McInnes had been liaising with Thistle manager Alan Archibald throughout the day. "He was still hopeful even as early as mid-afternoon that the game could still go on, but I think the weather has just gone against everything and the pitch hasn't been able to cope," said McInnes. "We are used to games being called off, but we were really keen, we prepared for the game and you put in that much preparation, you know we came down last night and were ready for the game. "I think with the way the weather has been all day in Glasgow our worst fears came true and the game is off, but we just have to get on with it and move on to the next game, which is St Johnstone at home." The call-off denies Aberdeen, who sit second in the Premiership table, the chance to draw level with leaders Celtic should they have won at Firhill. Celtic now have the chance to move six points clear should they win their home game against Inverness Caledonian Thistle on Saturday. Thistle could have moved about Motherwell and Hamilton Academical, who have played three games more than the Glasgow side, into eighth place had they defeated the Dons. A win for Kilmarnock at home to Dundee on Saturday would leave Alan Archibald's side sitting in second bottom spot. The postponement has also denied the first 2,000 fans to arrive at Firhill the chance to receive limited edition seat cushions designed by visual artist Kota Ezawa. The cushions, based on Katsushinka Hokusai's 1830 print "The Great Wave Off Kanagawa", were to be held up in a "Mexican Wave" in support of the home team.